We’ve come a long way together, The Somnambulist and I.
I started work on the manuscript in the summer of 2001, writing in the lulls between a succession of dull temporary jobs, scribbling annotations in packed train carriages during my morning commute and struggling to concentrate on intricacies of plot whilst the couple who lived in the flat upstairs hurled abuse, obscenities and items of furniture at one another in what sounded like equal measure. From the beginning, my ambition was to write the kind of novel that I’d like to read myself, packed with full-blooded melodrama, outrageous characters and shameless cliffhangers. I wanted to pay homage to the things I’ve always loved: Sherlock Holmes, Doctor Who, Frankenstein, Charles Dickens, Alan Moore’s From Hell, Neil Gaiman’s Neverwhere and the London histories of Peter Ackroyd. I wanted a brilliant but troubled detective. I wanted grisly murders, ruthless villains, subterranean cults, sinister government agencies, unstoppable assassins and the city in grave danger. I wanted shocks and scares and gasps of astonishment. But I also wanted something new - a story infused with my own, idiosyncratic sense of humour, a narrative which would never move in quite the direction that you’d expect and for the whole thing to be told by an extraordinary narrator who would compel you to read on by sheer, malevolent force of will. Naturally, there were times when I flagged, grew frustrated and became convinced that no-one would ever want to read what I’d written and I’ll always be profoundly grateful to a small group of loyal, indulgent but nonetheless often bracingly honest friends who, having been fed the story chapter by chapter, encouraged me to return to Edwardian London and discover the fates of Edward Moon and the Somnambulist. 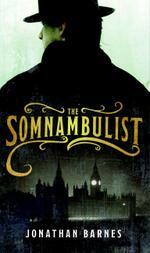 Now, almost seven years later, I’m very proud to say that The Somnambulist is hitting the bookshelves of America in a heart-stoppingly beautiful edition from William Morrow. Does it succeed? Did I achieve any of those things that I set out to do when, closing my ears against the ruckus from upstairs, I first set pen to paper? I hope so - or some of them at least. And since I’m here all week, perhaps you’ll let me know? I have just finished your novel, and am just astounded, especially after reading more about you as an author. It's as if someone stole the words from my mouth as far as interests and what I would want to see in a book. I have just finished my senior thesis on Sherlock Holmes and Jack the Ripper, and am returning to London to complete a novel on the two characters. I am also an avid Dr. Who, Neil Gaiman, and Alan Moore fan, and definitely saw those influences in your work (especially in the character of Cribb echoing Doctor Who). I would absolutely love to meet with you when I'm in London or talk through e-mail about your influences, being a young writer dealing with the subject of Victorian London, maybe even get an interview for the Sherlock Holmes section of my book. If you get this, please e-mail me at amberbristow47@yahoo.com. I would love to talk!